Plasmacytoid dendritic cells (pDCs) are well known as the major cell type that secretes type I IFN in response to viral infections. Their role in combating other classes of infectious organisms, including bacteria, and their mechanisms of action are poorly understood. We have found that pDCs play a significant role in the acute response to the intracellular bacterial pathogen Legionella pneumophila. pDCs were rapidly recruited to the lungs of L. pneumophila-infected mice, and depletion of pDCs resulted in increased bacterial load. The ability of pDCs to combat infection did not require type I IFN. This study points to an unappreciated role for pDCs in combating bacterial infections and indicates a novel mechanism of action for this cell type. Legionella pneumophila is an opportunistic intracellular pathogen in humans and the major cause of Legionnaires’ disease. A combination of innate and adaptive immune responses are critical in controlling L. pneumophila infection in mice, with IFN-γ (1), MyD88 (2, 3), and T cells playing major roles (4). Several in vitro studies have also investigated the role of type I IFN (IFN-I) in restricting L. pneumophila colonization of cells. For example, mouse bone marrow-derived macrophages deficient in the IFN-IR (IFNAR) are more permissive for L. pneumophila replication, and the pretreatment of permissive macrophages with IFN-I inhibits growth of the bacteria (5–7). Also, IFN-β expression is induced upon L. pneumophila infection of mouse macrophages and in a human alveolar basal epithelial cell line (7–10). One aim of this work was to investigate the role of IFN-I in limiting L. pneumophila infection in vivo, as this had not been thoroughly investigated. A major cell type that produces IFN-I is the plasmacytoid dendritic cell (pDC), a cell type with distinct functional characteristics compared with conventional Ag-presenting DCs (11–13). pDCs may traffic through some tissues in the steady state, but they are rapidly recruited by infection and inflammatory mediators (13). The role of pDCs in different types of infections is still unclear. pDCs produce large quantities of IFN-I in response to viral infections (14, 15); however, some studies have also begun to explore the contribution of pDCs to nonviral immune responses. For instance, pDCs are able to recognize bacterial RNA, resulting in the production of IFN-I (16). pDCs also produce IFN-I when exposed to Borrelia burgdorferi in vitro (17). Finally, pDCs can activate CD4 T cells via Ag presentation and secretion of IL-12 in response to Toxoplasma gondii infection (18). As IFN-I may also be an effector molecule used in the clearance of intracellular bacterial infections, such as L. pneumophila, we studied the role of pDCs in a mouse model of L. pneumophila infection. We demonstrated that pDCs do indeed play a role in combating L. pneumophila, although IFN-I was not required for this effect. L. pneumophila strains 130b (ATCC BAA-74) and JR32 and the flagellin mutant ΔflaA JR32 (19) were used for mouse infection studies. GFP-expressing L. pneumophila strain 130b was used for all in vitro infection studies. gfp was expressed from the plasmid pMip, a derivative of the cloning vector pMMB207, which was introduced into L. pneumophila 130b by electroporation as described previously (20). All bacterial strains were cultured in ACES-buffered yeast extract broth or on buffered charcoal yeast extract agar. A strain mice, C57BL/6 and IFNAR2−/− (21) mice, were obtained from the Department of Microbiology and Immunology or the Bio21 Molecular Science and Biotechnology Institute (University of Melbourne, Parkville, Victoria, Australia) or the Animal Resource Centre (Canning Vale, Western Australia, Australia). All mice were housed under specific pathogen-free conditions, and experiments were conducted with approval from The University of Melbourne Animal Ethics Committee. Mice were anesthetized with ketamine and xylazine and restrained on their backs with the larynx illuminated. A 20-gauge catheter was used to intubate the trachea, and 2.5 × 106 CFU L. pneumophila in 25 μl PBS was slowly injected into the lungs followed by an equal volume of air using a blunt Hamilton syringe. For analysis, lungs and spleens were harvested aseptically and homogenized followed by lysis of cells with 0.05% saponin in PBS. Intracellular L. pneumophila were enumerated by serial dilution and plating onto buffered charcoal yeast extract agar. Mice were depleted of pDC using the mAb 120G8 (22). Mice were injected i.p. with 1 mg/mouse 120G8 mAb or rat IgG (Sigma-Aldrich, St. Louis, MO) the day before infection and were given additional doses of Ab each day after inoculation until mice were killed (Supplemental Fig. 1). Depletion of pDCs in the lung and spleen of 120G8-treated mice was ~95% at 72 h postinfection. Single-cell populations from the spleen or lung were generated by enzymatic digestion and labeled with combinations of Abs. Enumeration of cells was calculated based on a known quantity of allophycocyanin-conjugated beads added to each sample. Abs and beads were purchased from BD Pharmingen (San Diego, CA) or eBioscience (San Diego, CA). Cells were analyzed on a CyAN ADP Analyzer (Beckman Coulter, Fullerton, CA) using Summit software. DCs were enriched by Nycodenz medium (Nycomed, Oslo, Norway) centrifugation from collagenase-DNAse digests of spleen as previously described (23). Macrophages were harvested from mouse peritoneal washes. Cells were incubated with the GFP-expressing L. pneumophila at a multiplicity of infection of 50 at 37°C for 2 h using RPMI 1640 media supplemented with 10% FCS and glutamine in microcentrifuge tubes. DCs were seeded into 96-well tissue culture plates at a density of 1–1.5 × 106 cells/well. Macrophages were isolated by adherence purification on coverslips before confocal microscopy. Cells were cultured in RPMI 1640 media for 24 h at 37°C and 5% CO2 before analysis. L. pneumophila-infected DCs were labeled with anti-pDC Ag (PDCA)-1 and allowed to adhere onto coverslips coated with anti-MHC class II Ab (eBioscience). L. pneumophila-infected macrophages were labeled with anti-CD45. Cells were fixed in 4% paraformaldehyde, and images were acquired using a Leica LCS SP2 confocal laser-scanning microscope (Leica Microsystems, Deerfield, IL). Two-tailed Mann-Whitney U tests were performed using Prism software (GraphPad, San Diego, CA). Comparisons giving p values ≤0.05 were considered significant. To determine if pDCs were recruited during L. pneumophila infection, lung infiltrates were analyzed at 24 h and 72 h after infection. Significant increases in the number of CD45+CD11cintMHCIIintPDCA-1+CD11b−F4/80− pDCs were observed at 24 and 72 h after infection compared with mock-infected mice (representative flow cytometric plots are shown in Supplemental Fig. 2; enumeration is shown in Fig. 1). The mean number of pDCs increased by ~4-fold in the lungs of infected mice at 72 h compared with 24 h, suggesting an active recruitment of pDCs during the course of infection. Recruitment of pDCs into the lung during influenza virus and respiratory syncytial virus infection has been reported (24–26), but this is the first report of pDCs infiltrating the lung during a bacterial infection. pDCs are recruited into the lung after L. pneumophila infection. A strain mice were infected with 2.5 × 106 CFU L. pneumophila 130b per mouse. Mock-infected mice received PBS. At 24 and 72 h after infection, lungs were harvested and analyzed for the presence of pDCs by flow cytometry as described in Supplemental Fig. 2. Total number of pDCs detected in the lungs of L. pneumophila infected and control mice at 24 and 72 h after infection are shown. Each circle represents a single mouse. Mean ± SEM is shown. Data are pooled from four independent experiments. **p < 0.001. L. pneumophila can infect bone marrow-derived DCs, a heterogenous population that may include pDCs (19, 27–29). To discover if L. pneumophila can infect pDCs, splenocytes from A strain mice were enriched for DCs by density gradient centrifugation and cultured with GFP-expressing L. pneumophila strain 130b. The DC-enriched splenocytes were then labeled with anti–PDCA-1 and anti-CD11c mAb for flow cytometric analysis. The proportion of L. pneumophila-infected cells was determined by analyzing GFP fluorescence in gated populations of pDCs, conventional DCs, and non-DCs (Supplemental Fig. 3). The proportion of L. pneumophila-infected cells was 43.03 ± 2.41% and 36.02 ± 4.55% for pDCs and conventional DCs, respectively, demonstrating that ex vivo-harvested DCs can become host cells for L. pneumophila infection (Fig. 2A). A significantly smaller proportion of non-DCs (10.60 ± 1.43%) was infected by L. pneumophila when compared with pDCs or conventional DCs, suggesting that under these culture conditions, L. pneumophila has a tropism for DCs (Fig. 2A). To determine if L. pneumophila could replicate in pDCs, the number of bacteria in each pDC was counted using confocal microscopy and compared with the number in infected peritoneal macrophages (Fig. 2B). All of these pDCs contained intracellular bacteria rather than bacteria adhering on the outside of the plasma membrane, demonstrating that pDCs can internalize L. pneumophila (Fig. 2C). The mean number of intracellular bacteria in pDCs was significantly lower than in macrophages, a cell type in which L. pneumophila replicate efficiently. 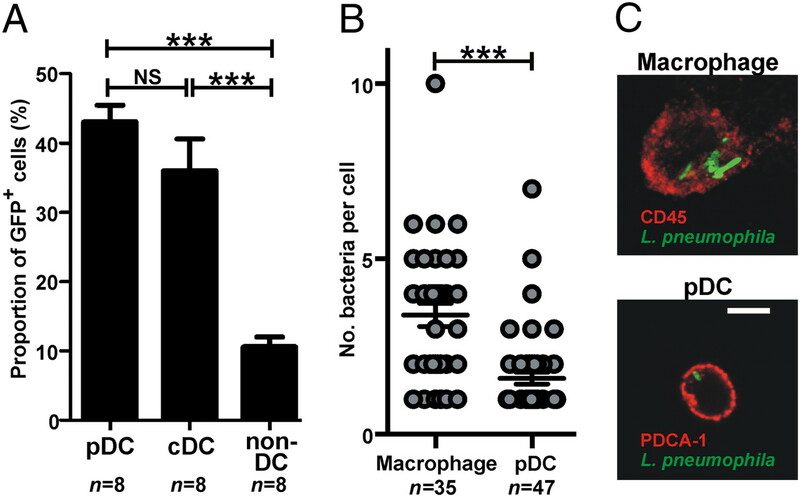 Only 13% of pDCs contained >2 bacteria compared with 57% of macrophages, suggesting an impaired ability of L. pneumophila to replicate in pDCs (Fig. 2B). pDCs are infected by L. pneumophila. Splenocytes from A strain mice were enriched for DCs by density gradient centrifugation and cultured with GFP-expressing L. pneumophila 130b for 2 h. Cells were cultured for 24 h before analysis by flow cytometry or confocal microscopy. A, Proportion of L. pneumophila-infected cells. B, DCs and peritoneal macrophages were cultured with GFP-expressing L. pneumophila and the number of intracellular bacteria per cell determined by confocal microscopy. C, Representative images of L. pneumophila-infected pDCs and macrophages. Red, PDCA-1 for pDCs and CD45 for macrophages; green, GFP-expressing L. pneumophila. Scale bar (for both panels), 5 μm. Data are pooled from two to three independent experiments. Mean ± SEM is shown. ***p ≤ 0.0002.
pDCs are important agents in combating viral infections via the production of IFN-I (14, 15). To determine if pDCs play a role in the immune response against L. pneumophila, A strain mice were depleted of pDCs with mAb 120G8 before infection with L. pneumophila. The details of Ab treatments used for experiments analyzed at different time points are shown in Supplemental Fig. 1. No significant difference in the number of L. pneumophila CFU was detected in the lungs of pDC-depleted and control A mice 24 h after infection (Fig. 3). However, significantly more L. pneumophila CFU were detected in the lungs of pDC-depleted mice compared with controls at 48 h and 72 h after infection, with ~20-fold more bacteria present in pDC-depleted mice at 72 h (Fig. 3). This clearly shows that the specific depletion of pDCs results in a more severe lung infection. Furthermore, mice depleted of pDCs had more severe systemic infection at 48 h after infection as evidenced by an ~8-fold increase in splenic bacteria load compared with control mice (depleted: n = 8, 95.0 ± 41.4 CFU versus control: n = 10, 12.0 ± 6.8 CFU; p = 0.03). pDCs restrict L. pneumophila infection in vivo. A strain mice were injected i.p. with 1 mg/mouse pDC-depleting mAb 120G8 24 h before infection with 2.5 × 106 CFU L. pneumophila 130b. Control mice received rat IgG. Treatment regimes are depicted in Supplemental Fig. 1. Total number of L. pneumophila CFU detected in the lungs of pDC-depleted and control mice are shown. Each circle represents a single mouse. Open circles, mice administered with 120G8 mAb; gray circles, mice administered with rat IgG. Mean ± SEM is shown. Data are pooled from five independent experiments. *p < 0.04; **p < 0.006. To determine if IFN-I plays a role in the immune response against L. pneumophila, we used mice deficient for the IFN-IR (IFNAR2−/−) on the C57BL/6 background. To obtain robust infection of C57BL/6 mice, we used a flagellin-deficient (ΔflaA) mutant of L. pneumophila. C57BL/6 mice have a more active flagella-sensing Naip5/Birc1e compared with A strain mice and thus are able to clear wild-type bacteria more effectively (30, 31). The flaA mutant was derived from the L. pneumophila JR32 strain, so we verified that infection by L. pneumophila JR32 is restricted by pDCs in a similar manner to the 130b strain in A mice (Supplemental Fig. 4). Subsequently, IFNAR2−/− mice were infected with ΔflaA L. pneumophila. 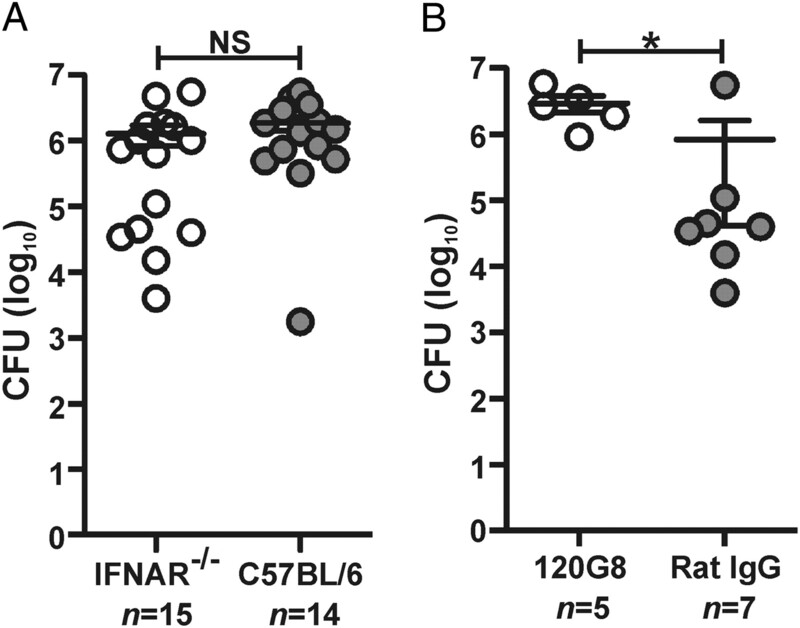 No significant differences in the number of L. pneumophila CFU were detected in the lungs of IFNAR2−/− mice compared with control C57BL/6 mice at 48 h after infection (Fig. 4A). IFN-I–mediated responses do not influence colonization of L. pneumophila in mice. Mice were infected with 2.5 × 106 CFU ΔflaA L. pneumophila strain. At 48 h after infection, lungs were harvested and the bacteria load determined. Each circle represents a single mouse. A, Total number of L. pneumophila CFU detected in the lungs of infected IFNAR2−/− and C57BL/6 mice are shown. Open circles, IFNAR2−/− mice; gray circles, C57BL/6 mice. Data are pooled from three independent experiments. B, Total number of L. pneumophila CFU detected in the lungs of pDC-depleted and control IFNAR−/− mice. Mice were administered Ab according to Supplemental Fig. 1ii. Open circles, mice treated with 120G8 mAb; gray circles, mice treated with rat IgG. Data are pooled from two independent experiments. All error bars are mean ± SEM. *p < 0.05. To prove that the control of L. pneumophila infection by pDCs did not require IFN-I, IFNAR2−/− mice were depleted of pDCs using the 120G8 mAb treatment (Supplemental Fig. 1ii) before infection with ΔflaA L. pneumophila. Similar to A strain mice at 48 h after infection, the lungs of pDC-depleted IFNAR2−/− mice contained significantly higher numbers of L. pneumophila compared with nondepleted controls (Fig. 4B). Recently, several reports have indicated that L. pneumophila induces IFN-I in infected cells and that IFN-I may help control infection. In this study, we have shown that in a mouse model, IFN-I does not appear to be required to limit L. pneumophila replication during the acute phase of infection (Fig. 4). This work is consistent with a recent report showing that mice deficient in molecules essential to IFN-I production and signaling were colonized to levels similar to that of control mice by L. pneumophila (32). Sporri et al. (33) also found IFNAR deficiency did not influence L. pneumophila colonization of the spleen in the less physiological i.v. infection model. It seems likely that in normal mice, other cytokines, such as TNF-α and IFN-γ, are sufficient to mediate clearance (1). Whether this is true in humans or immunocompromised individuals remains to be determined. We established that pDCs were recruited to the lung early in infection by L. pneumophila (Fig. 1) and that pDCs played a significant role in controlling L. pneumophila replication and persistence in mice (Figs. 3, 4). The main reported modes of action of pDCs in combating infection are the secretion of IFN-I and/or the presentation of peptides derived from pathogens to T cells. In this study, we ruled out a requirement for the former mechanism, as IFNAR2−/− mice depleted of pDCs had increased bacterial load relative to nondepleted IFNAR2−/− mice (Fig. 4B). A T cell-dependent mechanism also seems unlikely given the short time frame of our experiments. The effects of pDCs were apparent within 48 h of infection, which is too early for an adaptive T cell-mediated response. One alternative mechanism is that pDCs produce cytokines other than IFN-I that can be used to combat bacteria. Little attention has been paid to pDC cytokine production other than IFN-I, but pDCs do produce IL-12 (18, 34), and pDCs deficient in IL-18 production are unable to stimulate IFN-γ production in HSV infection (35). It will be important to look at the full gamut of cytokines produced by pDCs in response to infectious agents, especially IL-12 and IL-18, both of which have been shown to be important in controlling L. pneumophila infection (33, 36). Another possible mode of action relates to our discovery showing the ability of pDCs to become infected by L. pneumophila that we have demonstrated in this paper (Fig. 2). A recent publication has shown that L. pneumophila-infected bone marrow-derived DCs undergo more rapid apoptosis than infected macrophages (19). It may be possible that pDCs infected with L. pneumophila also undergo rapid apoptosis and, thereby, limit replication of bacteria. Furthermore, we noted that the majority of infected pDCs contained only one or two bacteria after a 24-h infection, suggesting that L. pneumophila replicated poorly in pDCs, which may also serve to limit infection. Our work has demonstrated that pDCs can combat an intracellular bacterial infection. It will now be important to determine if pDCs are involved in the immune response to other bacterial pathogens. Furthermore, this work has shown that pDCs contribute to innate immune responses by mechanisms other than IFN-I production. Further investigation of this system may uncover previously unappreciated activities of pDCs in the innate immune response. We thank Fiona Houghton for assistance with the confocal microscope, Max Walker and David Taylor for assistance in animal care, Craig Roy (Yale University, New Haven, CT) for providing the JR32 and ΔflaA strains, and Hayley Newton for constructing GFP-expressing L. pneumophila. This work was supported by grants to E.L.H. and I.R.v.D. from the National Health and Medical Research Council and Australian Research Council.
. 2002. Role of interferon-gamma in inflammatory responses in murine respiratory infection with Legionella pneumophila. J. Med. Microbiol. 51: 225–230.
. 2009. Multiple MyD88-dependent responses contribute to pulmonary clearance of Legionella pneumophila. Cell. Microbiol. 11: 21–36.
. 2006. Myeloid differentiation primary response gene 88- and toll-like receptor 2-deficient mice are susceptible to infection with aerosolized Legionella pneumophila. J. Infect. Dis. 193: 1693–1702.
. 1998. Legionella pneumophila infection in intratracheally inoculated T cell-depleted or -nondepleted A/J mice. J. Immunol. 160: 316–321.
. 2004. Type I IFN protects permissive macrophages from Legionella pneumophila infection through an IFN-gamma-independent pathway. J. Immunol. 173: 1266–1275.
. 2007. Restriction of Legionella pneumophila growth in macrophages requires the concerted action of cytokine and Naip5/Ipaf signalling pathways. Cell. Microbiol. 9: 2344–2357.
. 2009. Interferons direct an effective innate response to Legionella pneumophila infection. J. Biol. Chem. 284: 30058–30066.
. 2006. Legionella pneumophila induces IFNbeta in lung epithelial cells via IPS-1 and IRF3, which also control bacterial replication. J. Biol. Chem. 281: 36173–36179.
. 2008. IFNbeta responses induced by intracellular bacteria or cytosolic DNA in different human cells do not require ZBP1 (DLM-1/DAI). Cell. Microbiol. 10: 2579–2588.
. 2008. Type IV secretion-dependent activation of host MAP kinases induces an increased proinflammatory cytokine response to Legionella pneumophila. PLoS Pathog. 4: e1000220.
. 2008. Differential MHC class II synthesis and ubiquitination confers distinct antigen-presenting properties on conventional and plasmacytoid dendritic cells. Nat. Immunol. 9: 1244–1252.
. 2007. Outside looking in: the inner workings of the cross-presentation pathway within dendritic cells. Trends Immunol. 28: 45–47.
. 2008. Antigen-presentation properties of plasmacytoid dendritic cells. Immunity 29: 352–361.
. 2004. Plasmacytoid dendritic cells in immunity. Nat. Immunol. 5: 1219–1226.
. 2008. Plasmacytoid dendritic cells and type I IFN: 50 years of convergent history. Cytokine Growth Factor Rev. 19: 3–19.
. 2009. Bacterial RNA is recognized by different sets of immunoreceptors. Eur. J. Immunol. 39: 2537–2547.
. 2009. Recognition of Borrelia burgdorferi, the Lyme disease spirochete, by TLR7 and TLR9 induces a type I IFN response by human immune cells. J. Immunol. 183: 5279–5292.
. 2008. Plasmacytoid dendritic cells are activated by Toxoplasma gondii to present antigen and produce cytokines. J. Immunol. 180: 6229–6236.
. 2009. Rapid pathogen-induced apoptosis: a mechanism used by dendritic cells to limit intracellular replication of Legionella pneumophila. PLoS Pathog. 5: e1000478.
. 2006. Identification of Legionella pneumophila-specific genes by genomic subtractive hybridization with Legionella micdadei and identification of lpnE, a gene required for efficient host cell entry. Infect. Immun. 74: 1683–1691.
. 2006. Suppressor of cytokine signaling 1 regulates the immune response to infection by a unique inhibition of type I interferon activity. Nat. Immunol. 7: 33–39.
. 2003. Mouse strain differences in plasmacytoid dendritic cell frequency and function revealed by a novel monoclonal antibody. J. Immunol. 171: 6466–6477.
. 2000. CD4 and CD8 expression by dendritic cell subtypes in mouse thymus and spleen. J. Immunol. 164: 2978–2986.
. 2009. Plasmacytoid dendritic cells are dispensable during primary influenza virus infection. J. Immunol. 182: 871–879.
. 2006. Plasmacytoid dendritic cells inhibit pulmonary immunopathology and promote clearance of respiratory syncytial virus. J. Exp. Med. 203: 1153–1159.
. 2006. Plasmacytoid dendritic cells limit viral replication, pulmonary inflammation, and airway hyperresponsiveness in respiratory syncytial virus infection. J. Immunol. 177: 6263–6270.
. 1992. Generation of large numbers of dendritic cells from mouse bone marrow cultures supplemented with granulocyte/macrophage colony-stimulating factor. J. Exp. Med. 176: 1693–1702.
. 2007. Generation and maturation of bone marrow-derived DCs under serum-free conditions. J. Immunol. Methods 323: 101–108.
. 2003. Legionella reveal dendritic cell functions that facilitate selection of antigens for MHC class II presentation. Immunity 18: 813–823.
. 2003. Birc1e is the gene within the Lgn1 locus associated with resistance to Legionella pneumophila. Nat. Genet. 33: 55–60.
. 2003. Naip5 affects host susceptibility to the intracellular pathogen Legionella pneumophila. Curr. Biol. 13: 27–36.
. 2009. Identification of host cytosolic sensors and bacterial factors regulating the type I interferon response to Legionella pneumophila. PLoS Pathog. 5: e1000665.
. 2008. A novel role for neutrophils as critical activators of NK cells. J. Immunol. 181: 7121–7130. 2001. Isolation and characterization of plasmacytoid dendritic cells from Flt3 ligand and granulocyte-macrophage colony-stimulating factor-treated mice. Blood 98: 3520–3526.
. 2007. A role for plasmacytoid dendritic cells in the rapid IL-18-dependent activation of NK cells following HSV-1 infection. Eur. J. Immunol. 37: 1334–1342.
. 2000. Immunomodulatory role of endogenous interleukin-18 in gamma interferon-mediated resolution of replicative Legionella pneumophila lung infection. Infect. Immun. 68: 6567–6573.